This is my grandmother, Hazel Hystedt, circa 1915. 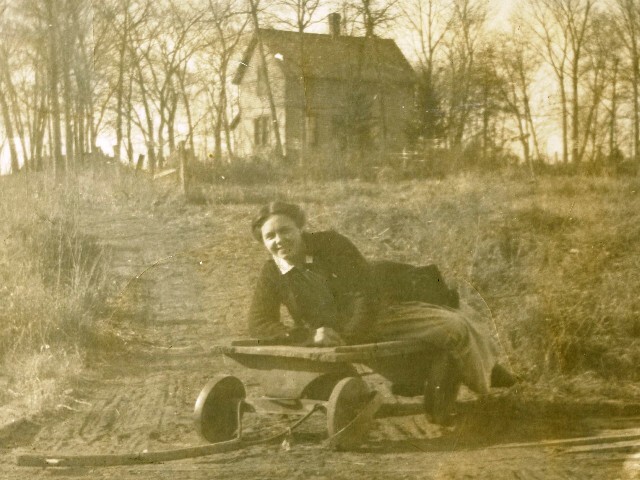 From 1914-1917 she was a public school teacher in a one-room school near Funkley, Minnesota. By her own account, she had 24 pupils in eight grades, and taught manual training, Home Ec, and Agriculture, and “was wanted to start a Sunday School.” (She declined that last.) One supposes she also taught reading, writing, arithmetic and history, but she did not mention these subjects. In her spare time she also started a Night School “for foreign speaking persons who wanted to learn English and for eighth graders who had missed their 8th grader diplomas.” That is where she met Roy C. Smith, who would become my grandfather. He was not a foreign speaking person, but he was most certainly a person who had not completed an eighth grade diploma. The record is unclear as to whether his ambition was to acquire his diploma or a wife. One thing is certain. Every one of their children completed high school – during the Great Depression! – and their grandchildren and great-grandchildren number among them quantities of college graduates and college professors. Grampa would be astonished, though quietly proud. Gram would not have been surprised at all. 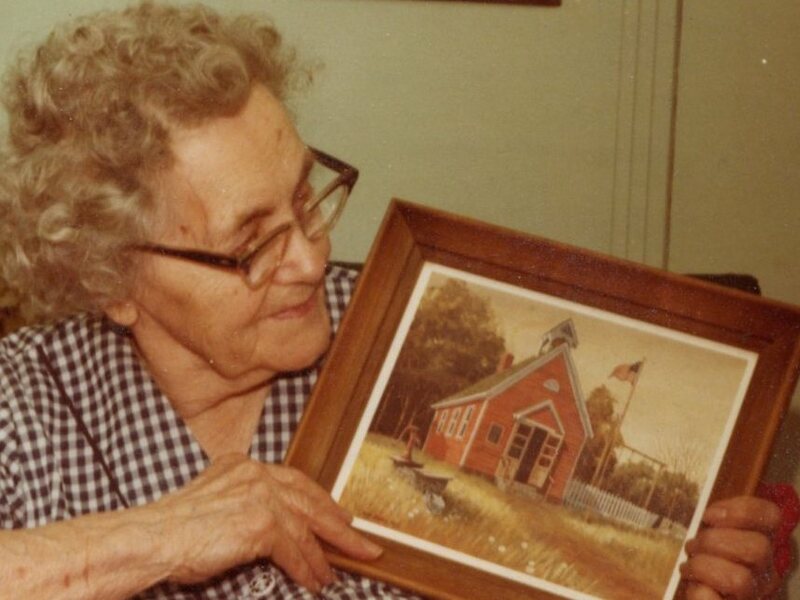 On the occasion of her 85th birthday, Hazel (Hystedt) Smith received the gift of a painting of a “little red schoolhouse” meant to commemorate her years as a teacher in a one-room school. Gram and the fallacious little red schoolhouse. She assumed her 7-year-old grandson would understand what “fallacy” meant. She was right. Last month my sister Mary and I went on an epic Family History Road Trip across northern Michigan through northern Wisconsin and all through Minnesota, ending up in Fargo, North Dakota. One of the highlights of the Road Trip was a search for Gram’s schoolhouse. We might have found it. At the very least, we found one very like hers, of the same vintage, not more than five miles from the one where she taught. If the Maesse School was not hers, we are pretty sure she would have known the teacher who taught there. They would have boarded together at the MacGregor farm, and would have had their mail delivered to the Funkley Post Office at Jack Fisher’s grocery store. We found our visit to the old schoolhouse a moving experience. These were, after all, our people. Antrim County is full of old schoolhouses, some of them repurposed, others turned into historic sites. All of them are treasured, because they symbolize a core value of this part of the country. The taxpayers will support public education – paid for by the taxpayers and free to the students – for all the children of the community. This is not at all the same thing as an education paid for by the taxpayers but provided by private entities for profit. Such a concept would have shocked the consciences of the taxpayers of Beltrami and Itasca and Hennepin Counties in Minnesota and of Antrim County Michigan 100 years ago. ‘Just saying’ indeed. Very just. I am astonished to have such a rapid reply. Instant gratification, I might say. When I recover from the surprise I must go explore my beloved blogging neighbors around the world. I’ve missed visiting. We get up on this side of the dirt, which is the first sign that things are going reasonably well. Miss Sadie and I are missing the Cowboy of blessed memory, who died last summer. We see him at the corners of our eyes everywhere we go. I will have to make a post of Cowboy images, but maybe not this week. This week is a catch up week! Well that’s a nice thing to say. Thank you. I couldn’t agree more. So well stated! Education for profit simply baffles my brain! Longing for that first visit north. Soon — the year is going quickly! It’s not that I mind profit – it’s that I think public service is a separate issue. Meanwhile the year flies past – come north, young soul, come north! How exciting to look for the school house where she taught. I love the photo of her from 1915. So casual and fun. Welcome back kiddo. Been a while. P.S. Sadly, I think it’s gonna be a looooong time before America is great again. My grandmother was a rascal. Thank you for the welcome back. It has been far too long, and I’ve missed blogging. Don’t count us out too quickly. We are a resilient people, and a stubborn one. There is life in the Republic yet. Just watch us . . . although perhaps from a safe distance would be best. Did you learn any of your grandmother’s teaching conditions beside the money? My great aunt from Ann Arbor taught at various one room school houses after getting her degree at the Normal College (EMU). I ended up with several of the teaching contracts she had to sign before she landed a job in Detroit. All of the contracts prohibited her from marrying. She never married. My grandmother married in April 1916 but taught for the entire 1916-1917 school year. I do not know the terms of her contract. I have a lot more research to do, and am looking forward to it! I don’t think it was only the teaching profession that prohibited women from marrying. My mom lived in Minneapolis and worked as a secretary, and had to hide the fact that she was engaged to my dad or she would have been fired. How crazy. I also agree we are a resilient people and our country will survive and thrive. So happy you are back writing, but sorry to hear about Cowboy. Hello Martha! I think you are right that many professions discriminated against married women – until businesses were faced with labor shortages. Thus Rosie the Riveter. Then when the men returned from war . . . the women were unceremoniously dumped. And still we persist! Heh heh. I confess to getting a charge out of watching Angela Merkel and Theresa May navigate the shark-infested waters of global politics. On balance I’ve decided to adopt an attitude of hope. Despair is very wearing. Love reading your posts! Very sorry to hear about Cowboy….I understand…just lost my 11 year old bulldog, Annie, in March…still saddens me. Glad all is well in your corner of the world, Gerry! Thank you. Condolences on the loss of Annie. It’s wonderful to have you back, although I’m saddened to hear the Cowboy isn’t with you any longer. One of the things I noticed during my swing through Kansas last fall was the number of schoolhouses that have been preserved, restored, and repurposed. My favorites are in the Flint Hills, I suppose — who can resist a stone schoolhouse with a bell? — but they’re all clearly cherished. My great-aunt Inazel taught in a one-room school in Iowa for some years. In fact, I have a photo of the school in which she taught. I suppose no one expected that she’d end up on a pineapple plantation, but life is filled with twists and turns. I really must write about that lady. There are scandalous details — we never can have too many of those. I look forward to the story of the pineapple plantation. I expect there is no one who can present unvarnished detail with greater authority than you. I’m sad over the Cowboy’s death, but I’m glad we had his companionship for all those years. One day I’ll do a whole post about him. 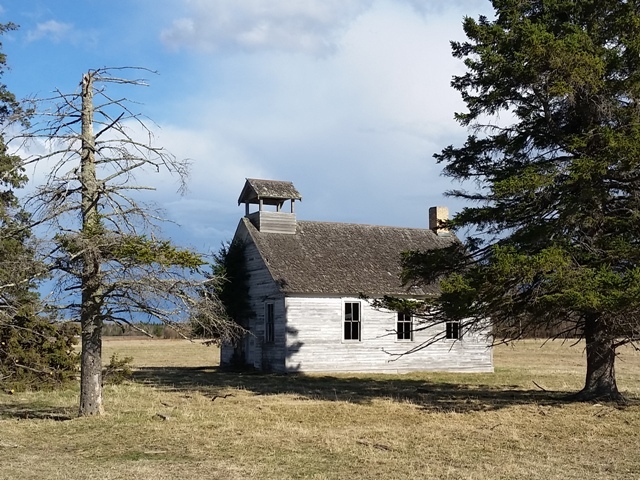 What a sweet post…and great photo of the schoolhouse. I like to think you found hers. She sounds a bit like you. I’m pretty sure I’m a lot like her. She was full of surprises. There is a lot more to come. I am on a roll, and can hardly wait to show you all the treasures. Great story, you brought your grandmother to life. My wife’s mother also taught in a one room school house in Northern N.Y. and in Vermont. As far as I have been able to find out they are no longer in existence. Thank you for your comment, Charles. I visited your family history blog and was very impressed with the work you’re doing. It’s a compelling enterprise, isn’t it! One thing I learned about finding one-room schools (at least those in Minnesota) is that the county and/or the state superintendents of education kept records of each school, its staff, the costs, attendance, curriculum. My to-do list includes finding those records for Beltrami and Itasca Counties. I love this, Gerry! Will have to locate Funkley on the map for my next trip through Wisconsin (en route to Twin Cities). Three cheers for your grandmother! Thank you PJ. I loved the trip. Downtown Funkley is a bit out of the way, and is pretty much reduced to the Funkley Bar these days, but if you really want to visit, it’s between Blackduck and Big Falls – about 40 minutes NE of Bemidji. While we wait for America to be great again, it’s a pleasure to enjoy your well-chosen words Gerry. They have been worth waiting for. It is interesting to read about the small schools in sparsely populated areas. The teachers there really helped to make America great. Sorry for your loss. The worst part of having friends that live shorter than us. Carsten, how nice to hear from you. Thank you for the kind words, and for the condolences. We have wonderful memories of the Cowboy, and we hold them close. I really enjoyed reading your recent blog, Gerry, although I was saddened to hear about the Cowboy’s passing. Yes, please, do write a whole post about this dear companion of many years. Your grandmother did make America great in her one-room school in MN. In the true sense of what education means and should be. Thank you for sharing these touching moments of your family history. Very grateful for your post and visit to mine. Thank you, Isa – I have been missing blogging and think I must get back to it. I have something to write about this weekend. And it is always a pleasure to visit you. Wonderful information! My aunt wrote to me, once, about some similar experiences she had teaching in Michigan’s northern Lower Peninsula. Just came across your blog as I was preparing for a trip up that way soon; I always enjoy reading about places I love. I’ve vacationed in the area since 1962, after our Akron neighbor, who owned a small cottage over in Mancelona, kept raving to my father about how gorgeous the region was, and how great the fishing was, too. For many years, we rented cottages on Clam Lake until about 1970, when we started staying in Traverse City. I believe our last trip together was in ’73; I don’t recall that we ever made it over to the NW side of Torch—we seldom went further north than Brownwood Acres or further south than Alden, aside from day-trips to Charlevoix or Petosky. What was so astonishing to me at the time was how most things had remained pretty much the same as I remembered—in fact, a lot of it was even better than I remembered. I often told our children how I always enjoyed getting up early and feeding the swans that came cruising down Clam Lake each morning; when, on that trip, we eventually caught sight of a small fleet of them approaching our boat, my heart almost burst out of my chest. I was nine years old again. Since then, my wife and I have visited four more times—mostly for boating events up in the Boyne City/Charlevoix area. I try to stop at Torch whenever I can—having a beer at The Dockside and remembering when it was an IGA, missing old Fetz’s Lodge across the road, and standing on the little beach there, where we all went for a swim in the ice-cold water. In this manner she knows to stay in her beach chair. Though I sometimes envy those folks who can live up there year-round (not so much during the winter) what I’ve found to be true is that people who fall under the spell of this place…never really leave at all.